This is a presentation about how Franklin County Emergency Management Coordinator Fred Mullen plans for and manages the risk of wildland fire. Mr. Mullen presented on a webinar that SCIPP held on March 30, 2017. Agenda from a webinar that SCIPP held for planners and emergency managers in Arkansas on March 30, 2017. These maps were created by Kristin Calhoun (National Severe Storms Laboratory and the Cooperative Institute for Mesoscale Meteorological Studies). 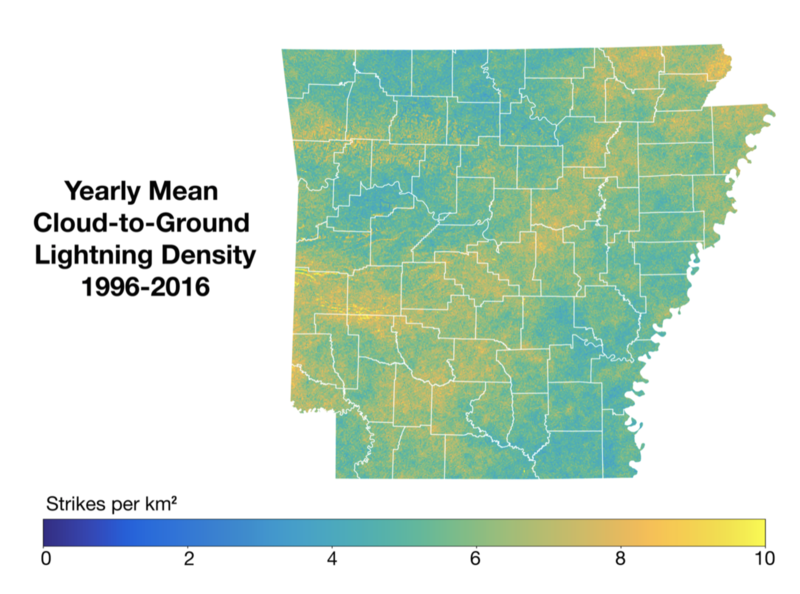 The maps show the mean cloud-to-ground lightning density from 1996-2016 for Oklahoma for 4 seasons (winter, spring, summer and fall) as well as yearly. The color scale represents the density of strikes per kilometer squared. The data have been provided by the Vaisala National Lightning Detection Network. 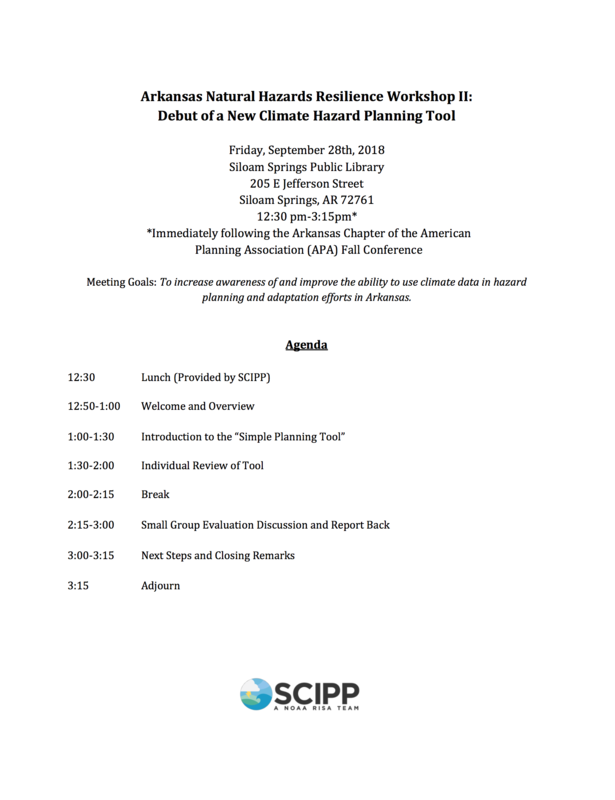 Agenda from a meeting SCIPP held for planners and emergency managers in Bentonville, AR on September 29, 2017. 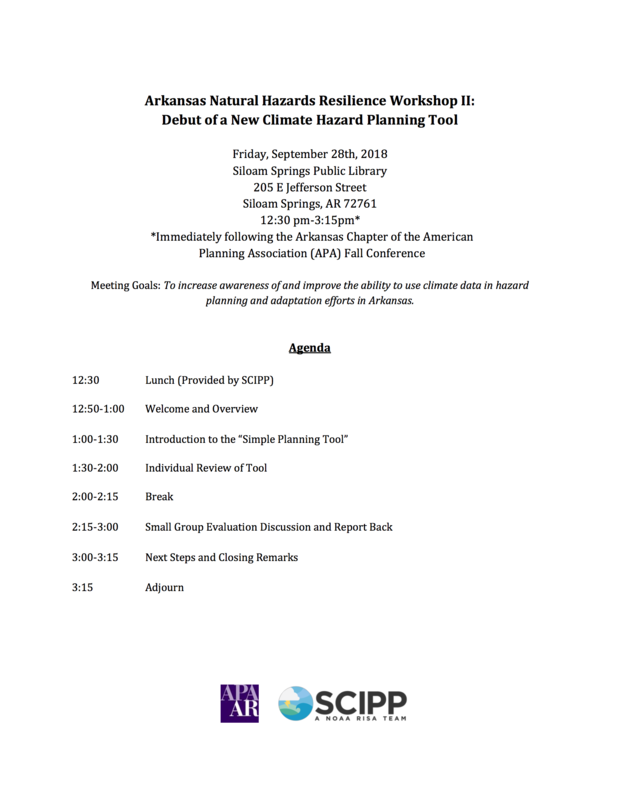 This agenda is for the Arkansas Natural Hazards Resilience Workshop II: Debut of a New Climate Hazard Planning Tool, occurring on Friday, September 28th. This is the agenda for the second Arkansas Natural Hazards Resilience Workshop, that occurred on Friday, September 28, 2018.